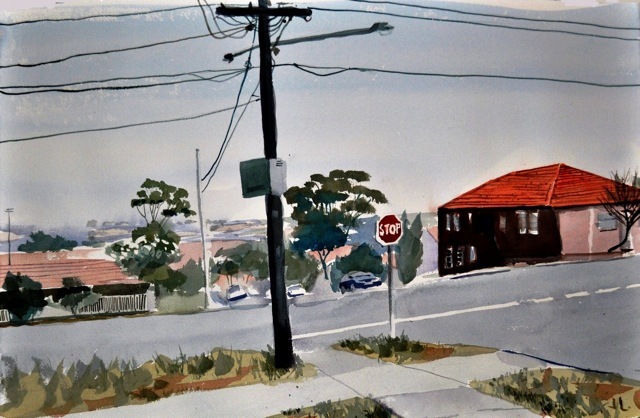 Your recent work focuses on the suburban landscape of Sydney, rather than the landmark elements of the city or, as in earlier work, the rural Australian landscape. What is it about suburbia that appeals to you? My shift in focus represented a conceptual shift in my work. This was brought about by a move from Edinburgh to Sydney and my subsequent adaption to a new urban landscape. As a mother of young children much of my time is spent walking through the city achieving the necessary requirements of family life such as visiting playgrounds, parks, and shops. It is this regular movement through a new urban space that awoke me to the patterns and visual language of the city that surrounded me. Sydney has a very distinctive suburban landscape that is in itself a landmark. This is perhaps more so than the obvious landmark of the picture postcard Sydney Opera House, as it is the suburbs where Sydney people exist day-to-day. With this in mind I thought it would be interesting to imbue these forgotten landmarks with the same attention that is traditionally given to paintings of Sydney Harbour with the Harbour Bridge and Opera House. Therefore, my focus became the ‘everyday’ landmarks of the suburbs with the telegraph poles, the road signs, sidewalks, bungalows and roads. The intention was to make them look beautiful and epic to inspire the viewer to stop in their city, look around it and appreciate it. As well as training at Edinburgh College of Art, you studied geography to Masters level at the Universities of Edinburgh and Sydney. What impact has your geography understanding had upon your art practice and do you think your interpretation of the landscape has been influenced by it? I think my academic training in geography has been intrinsic to my recent work and has allowed me to explore my art practice to a much more interesting level. Like many artists, I struggled for a long time with the purpose and meaning of my art. When I attended Edinburgh College of Art in the late 90s I found it was a conceptually indulgent time for Art in Britain and many of the Art Colleges. The Young British Artists were at their height and it was a time when Tracy Emin’s ‘My Bed’ was nominated for the Turner Prize. I found that I could not relate to this conceptual foundation, as it seemed to be grounded in a celebrity and self obsessed voyeurism. Therefore, I decided to turn to a more academic grounding to examine conceptual ideas as I felt many of the Art Colleges at that time were not equipt to do this. In my academic studies I was lucky to be able to immerse myself in the ideas of urban geographers and wider social science thinkers. This has given me a strong foundation in the conceptual ideas that I want to investigate in my artistic work on the city. I have referenced these ideas for my recent work which attempts to unravel how place gains identity, how power works on place and how place influences us as we move through it. I used an approach to my urban subject matter called psychogeography made popular in the 1950s by Guy Debord and more recently by Will Self. The idea is to take walks through the city so to interact with it, create a new awareness of it and document its effect on emotions and behaviour. The landscapes depicted in my work are all stumbled upon on these psychogeographical walks through my local landscape. Your paintings take what could be rather mundane views and imbue them with energy and vigour, taking advantage of the strong Australian light to enliven the scenes with a depth and chiaroscuro quite unusual in watercolour. Having divided your painting career between Scotland and Australia, how would you compare the different qualities of light in those countries and its effect on your work? My work does not exaggerate but rather it distills the elements to make us look closer. Those views we designate as mundane are in-fact full of interest and charm it just depends on the psyche. I am not taking advantage of the Australian light as these urban spaces do create an energetic display of light and shadow that moves with the day. It is these sharp shadows that I find a distinctive contrast to Scotland and perhaps a landmark characteristic of the Australian landscape. On a similar theme, another notable aspect of the Sydney paintings is the colour saturation. When you lived in Edinburgh, your paintings of that city strove hard to find colour – not always an easy task in a cold, grey city. Sydney on the other hand seems a natural fit for your love of exuberant tones and the resultant paintings are rich evocations of the hot streets and coastline. Your palette always seems very controlled however. Can you tell us something about your approach to colour and how you use it to add detail and atmosphere without overloading the painting? My use of colour is instinctive and a reaction to the subject matter. My approach to my painting is a rapid but meditative use of my materials. I work surrounded by my paints, a selection of about ten different brushes, sticks, inks, and pencils. I work fast and with fluidity. At any one time my left hand is full of my materials and my right hand applying them. I change materials regularly and paint with vigour until eventually resolving to stop, stand back and decide if it is complete. As well as Scotland and Australia, you lived in Hong Kong for several years, and developed an interest in Oriental art. Has this influenced your approach at all, in either technique or materials? 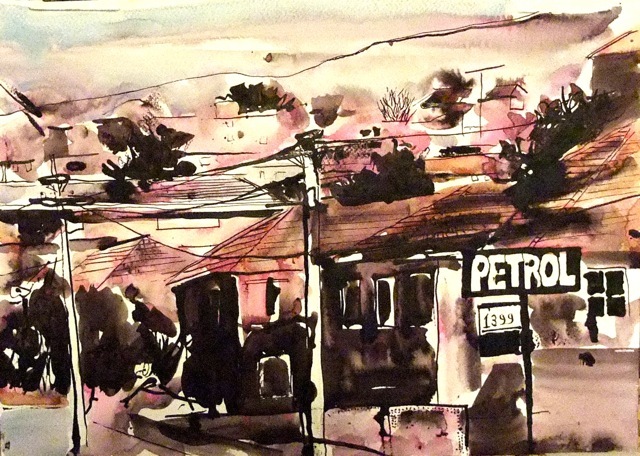 An image like ‘From Simeon Street Ink,’ for example, seems rather oriental in its reductive mark making. I was born and grew up in Hong Kong and my parents still live there so it holds a lot of attachment for me. I later moved to live in Edinburgh in Scotland and now Sydney in Australia. I think this international background has given me the opportunity to experience different perspectives. At present, my interest in Oriental art is similar to my interest in most other art forms, in that I like to understand the context that it is created and the values and concepts that mould it. I have chosen the reductive mark making as it distills opens up a unique way of looking at the urban landscape. When you were still based in Scotland, you worked predominantly in oils. 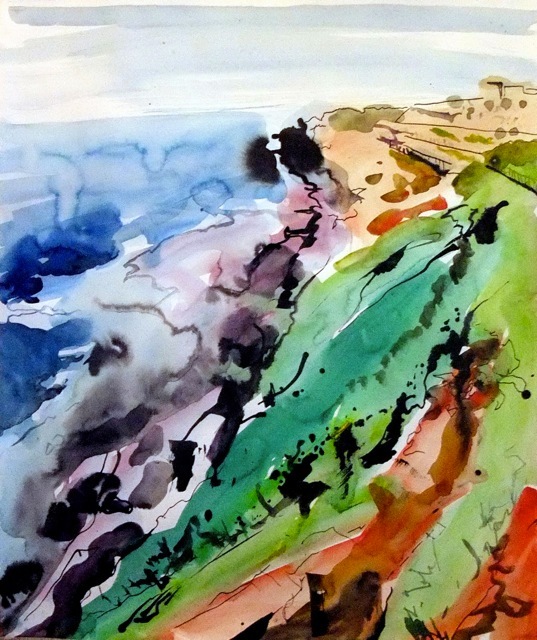 What precipitated the shift to watercolour upon moving to Australia? 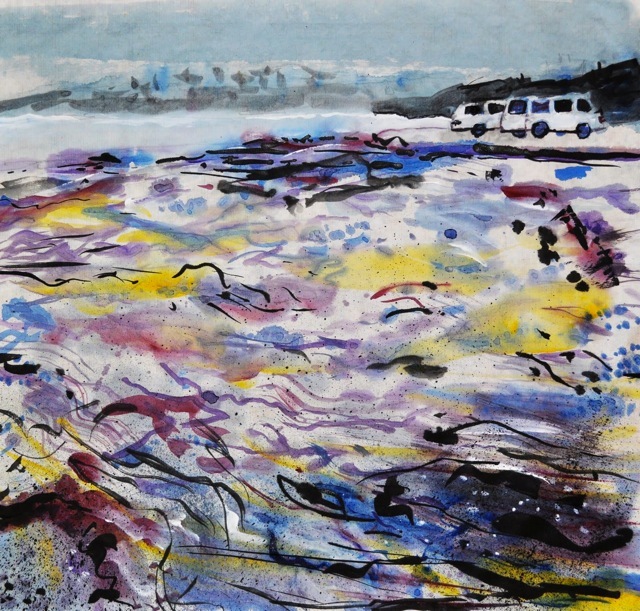 I initially choose to work in watercolours and inks in Sydney because of practical reasons relating to my time restrictions and being a mother to young children. Watercolours and inks provide a powerful medium that is quick drying, can be easily stored and do not release toxic fumes. Your watercolours are a long way from the staid image of the medium; they are vigorous, vibrant and punchy. What is the key, in your opinion, to producing such results from a notoriously difficult medium? I think the reputation of watercolours is unfair as they are an incredibly beautiful and offer so much. Furthermore, as a painter who has worked in most mediums I would also propose that watercolour is the most difficult medium. To produce a vigorous and vibrant painting in watercolour requires a meditative confidence. Unlike oil and arcrylic all the layers are exposed so there is no opportunity to paint over mistakes. I enjoy that each brushstroke has such gravity to the final piece. I also enjoy maximizing the function of each brushstroke so that it says as much as it can. I want to achieve the illusion with the least amount of marks. This is a real challenge and requires a deep focus and study of the subject matter. What is your opinion of the contemporary art scene in Sydney? How does it compare with Edinburgh, from the perspective of a working artist? I think the art scene is a very amorphous and subjective experience and it would be hard to compare. However, I believe art is a very powerful tool to express and generate ideas and that the outlets for this are present in both cities but it just depends on if you engage with it or not. Your recent exhibition at Gallery East was in an artist led space. What are the advantages of working with this system? I was very fortunate to get accepted to exhibit at Gallery East in Sydney as it has many successful and highly regarded shows. The Gallery is run by two established Australian Artists, Carol Ruff and Greg Weight. Both Carol and Greg are represented by the acclaimed Australian Galleries and they have huge exhibiting experience and knowledge. Under their mentoring I was able to bring together my recent work into an interesting and successful show. The advantages of this gallery system is that I had control of the presentation and marketing I have been more able to understand my own work and its direction. Furthermore, as I was working in the space throughout the show I had the opportunity to speak to a large amount of people about my work and in these discussions I learnt new insights into my work and the urban landscape on which it is based. I feel at this stage of my artistic development this was the best system for me to grow from and understand my work more clearly. Once I have established clarity in this I may aim to work in the commercial gallery system again. As the mother of two young children as well as being a part-time employee in your husband’s (ex-Olympic cyclist Paul Rowney) bike company, is it difficult to find enough time to work at your painting? Or do you find these different elements of your life complement one another? I find that I do not have enough time to develop my work however this is a consequence of my present artistic methodology. The core goal of my art career is to develop the ideas and conceptual foundation to my work. I feel I cannot do this if I view my painting as an income source. It is a very different goal to try to produce something that has a powerful elegant message compared to producing something that market wants to buy. However, it is worth noting that an advantageous consequence of this present methodology has been that my recent solo show was virtual a sell out. At this point if I was to be commercially minded I would produce variations of the work in this show, as I know there is a market. However, instead I want the freedom to continue evolving the ideas and work without being hampered by this commercial emphasis. My long-term goal is to continue to develop my work on the subject matter of urban landscape and how power is imprinted on it and in turn acts on us as we move through the space. As for my future exhibitions, I have a group and solo show in Gallery East next year and I plan to exhibit in Hong Kong, a city very close to my heart, at some point in the next couple of years. 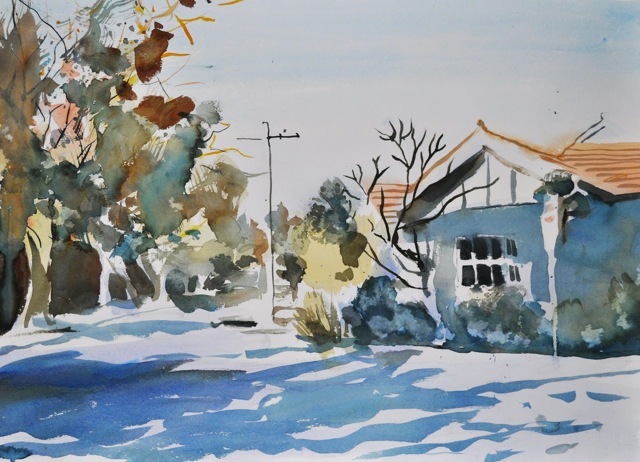 Loved reading the interview Nicci, and interested that you are now mainly working in watercolours. I will forward this to Alex who is still in Surabaya. I got lots of news of you and the family from your Mum last week. Very best wishes and I look forward to attending another of your exhibitions.